Responsive professional online shops designed and build around the industry leading ecommerce platform. Everything you need to sell almost anything online with an option to add dozens of services. We build online shops using the world’s most famous e-commerce solution “woo commerce”. 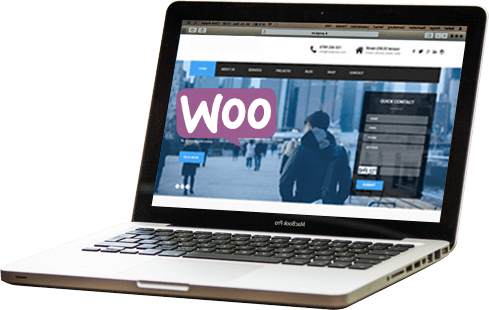 Hundreds of online shops using woo commerce as their online store solutions. We choose this e-commerce solutions specially for you, because when we hand over your online shop to you then after that without any difficulty you can upload your products due to the easy of the platform. Your online store will come with all the basic necessities and of course when you are ready to take your store to the next level, you will find us helping you with that as well. 150+ designs to choose from. This means that you have dozens of choices to select a design which suits to your industry or style. Just buy the website and we will create the same website for you. Not every online store is the same, different store needs different needs and sometimes it is very hard for the store owner to integrate his desired features into his/her store. That’s why we have dozens of e-commerce solutions available on our website to make the store owner life easier. Yes that’s right, we offer a free .co.uk domain with our website services, you just need to find a available domain name and ask us to register and that’s it, rest of the work we do for you. You can take your website with you at any time after the initial period of 12 months (if not extended). The content, images, code everything belongs to you and you will be the owner of your website. Our all packages comes with 1 month free technical support. If you stuck somewhere and needs help then you will find us there with you. After one month if you still needs assistance then you can ask us to buy additional months. We all know that how important social media is for our business. We have many in some times dozens of social media for your website.We can integrate the most important social media to your website. PayPal is the default payment option which already comes with your store but if you want to take payments through credit card then with some extra money we will make your store to accept the payments from all the major credit cards. We also provide SSL certificates. We will give you 3 email addresses if you host with us and of course if you need more than this, we can also provide you in some extra cost. So be free to choose the email address for any of your department. We can provide you the logo (as shown in your chosen website) free of charge but if you need a complete new design then we can help you out as well with some additional more cost. You also got covered for the web hosting. We provide you free reliable fast and secure web hosting included in our packages. Sometimes only paypal is not enough to take payments and store owner wants to take payments through credit cards, we are able to integrate the payment gateway system in your online store so you take credit cards as well. You will be able to take payments from majority of the cards including “Master card”, though there are many options available for the payment gateway in the market but we prefer “stripe” because it is the best and one of the oldest payment gateway out there. Now you have enough reasons to start your online web store.